Product description: Soaks into leather and draws out all grease and oil based stains. 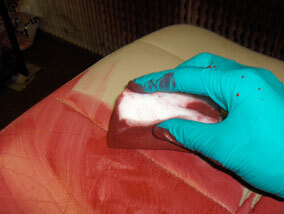 Common stains fixed are areas of grease and sweat from arms and head, plus cooking oil and other greasy spills. 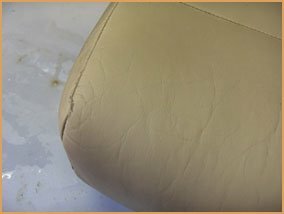 An integral part of many leather restoration projects, removing grease and oil contamination from leather furniture, car seats and clothing. Grease marks from arms & head/hair. 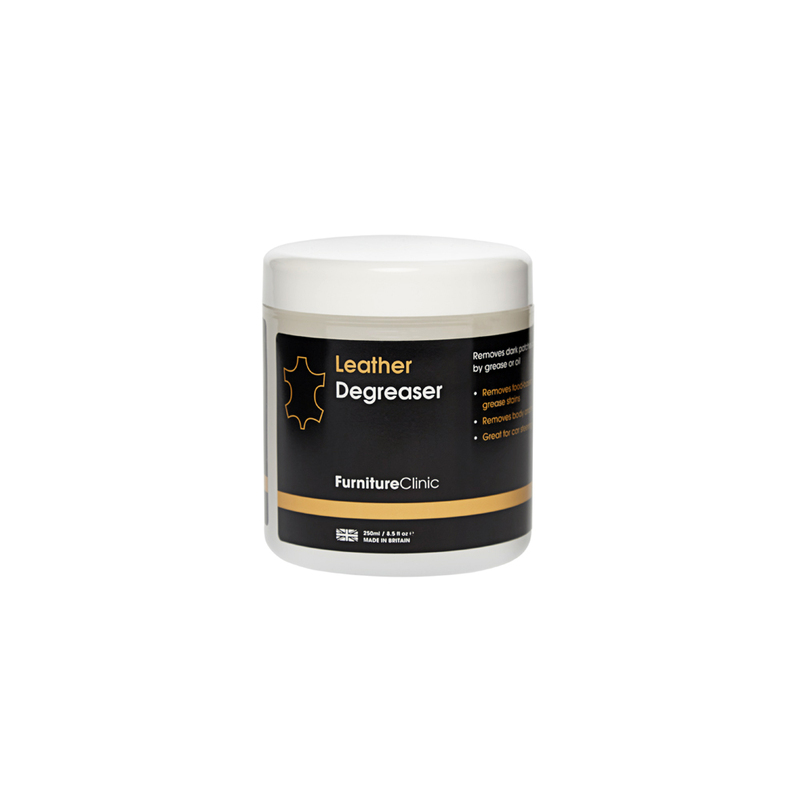 The Leather Degreaser is a thick paste that draws out all oil and grease stains from leather. 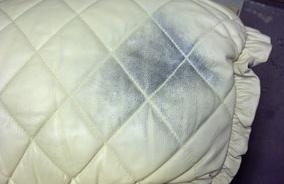 Head and arm grease patches on furniture. Dull greasy steering wheels from hand contact. Dull greasy collars on leather jackets. 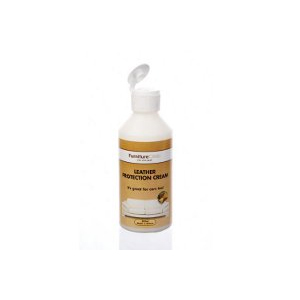 Cooking oil spill, air freshener spill or any other oily spill. Food spills, e.g. pizza, chips, curry grease etc. 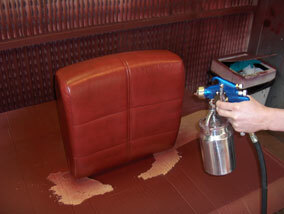 NOTE: The Leather Degreaser will also draw out ink stains and all other staining that has soaked into the leather (i.e. where the stain is not sitting on the surface). 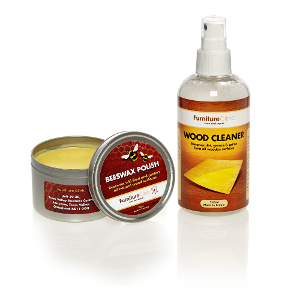 This is most common on absorbent types of leather such as Aniline & Pull Up style leathers. 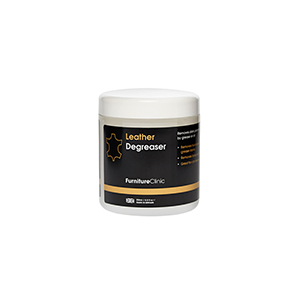 Leather Degreaser can be used on all different articles of leather, from furniture and car interior to clothes, shoes, handbags and even equestrian leathers. It works on all colours of leather and all different grain types except Suede/NuBuck & BiCast Leather. 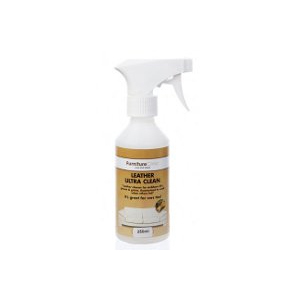 250ml Leather Degreaser is enough to degrease a large head area stain about 5 times. 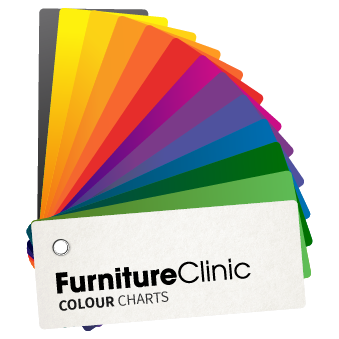 A large head area stain would be about 40cm x 40cm in size. 250ml would also be more than enough to degrease one off grease stains like those occuring when oil is dropped onto leather for example. The product will not go off but it can dry out if the lid isn’t sealed properly. 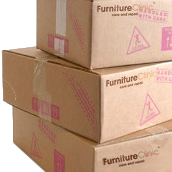 Make sure to store it in a cool cupboard with the lid tightly sealed. This was the worse of two stains on a three piece suite which had become heavily soiled with grease and other hair products. 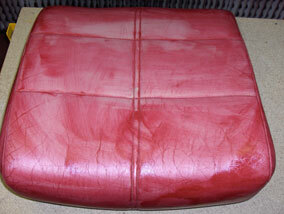 With Leather Degreaser the contamination was carefully extracted and colour restored with recolouring balm. This leather has absorbed head/hair grease over the years, which has stained the leather. 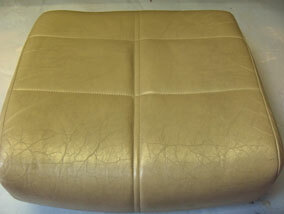 The contamination was extracted with Leather Degreaser, giving the leather a new lease of life. 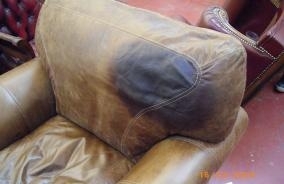 Being a semi-aniline leather, oil staining in the head area of this chair had become very obvious. 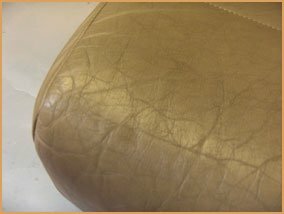 With multiple applications of Leather Degreaser the grease was successfully removed from the leather and the colour restored with Leather Recolouring Balm. 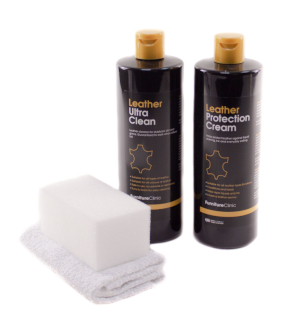 Clean the leather first using the Leather Ultra Clean. 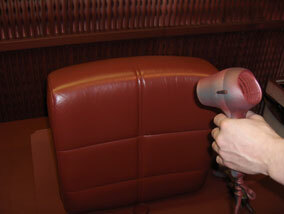 Spray the Leather Ultra Clean onto a Terry Towel and give the grease-stained area a thorough clean. 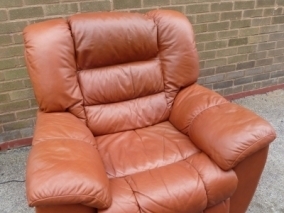 If the grease stain has built up over years of use (where you rest your head or hands) you should soak the leather in the Leather Ultra Clean and squeeze the leather through the Terry Towel. This will absorb a larger amount of grease into the towel saving the amount of Degreaser used. Using a paintbrush, spread the Degreaser onto the stained area and allow it to dry (drying times will differ depending on how greasy the leather is). As the product dries it will slowly absorb the grease - you will see this happening as the Degreaser will dry to a brown/yellow colour where it absorbs the grease, everywhere else will dry to a white colour. 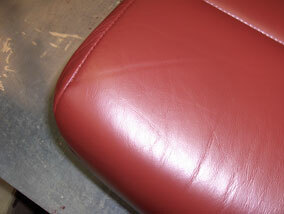 Once the Degreaser has thoroughly dried out it turns to a powder on the surface of the leather. This powder should then be vacuumed off. 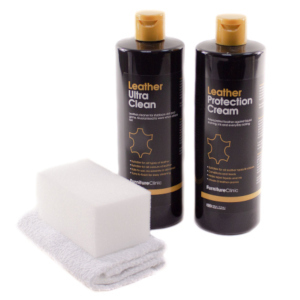 Clean the leather as before using the Leather Ultra Clean. 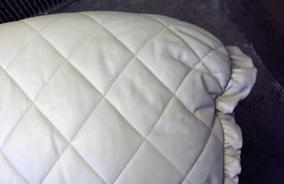 If the leather still has any grease left in it, keep repeating the above processes again until it has gone. 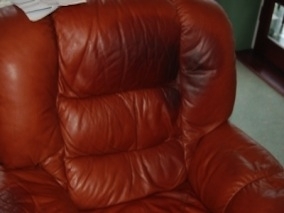 Once the grease has been removed the leather may need re-colouring. 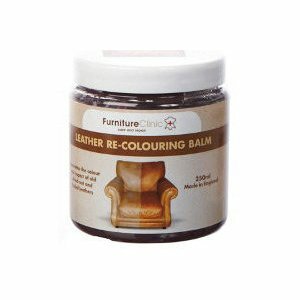 To do this use a Leather Re-Colouring Balm or Leather Colourant Kit. 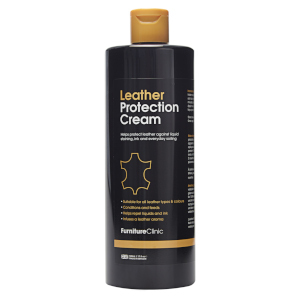 To stop grease being absorbed again, use the Leather Protection Cream once every three months for thorough grease stain protection. 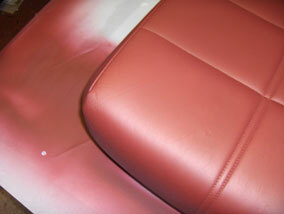 Note: Bi-cast (a very shiny and plastic like leather) can react with the degreaser and cause it to stick to the surface. This product is not suitable for bi-cast leathers. 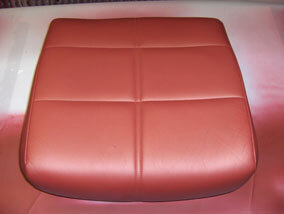 Please contact us if you are unsure of your leather type. I managed to spill an entire plate of cauliflower cheese on our leather armchair (don't ask). Needless to say it left a huge greasy stain on the chair. 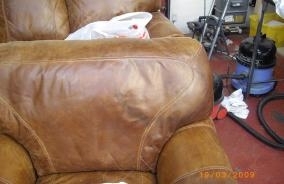 The degreaser worked its magic and in 2 applications the stain was completely removed! I can't recommend this product highly enough (although the smell of it will knock you sideways so don't get too close!). Good quality products. 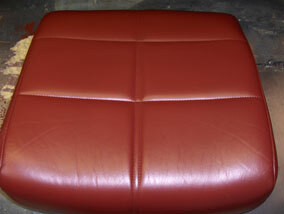 leaves leather suite looking like new again.